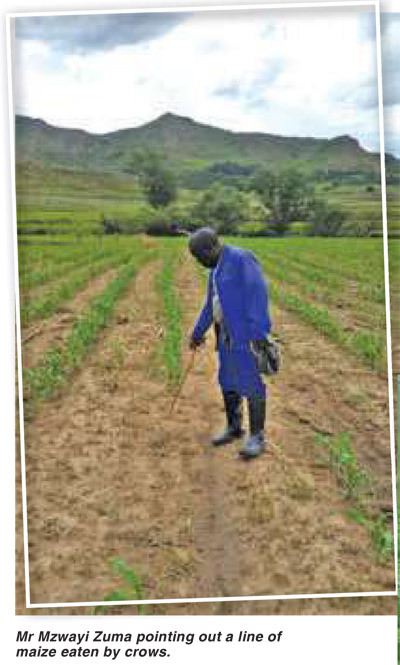 I am privileged to work closely with many smallholder and subsistence farmers in the rural areas of KwaZulu-Natal. Continually these farmers amaze me with what they can achieve on a small piece of land, and this while facing many adverse challenges daily. What has become evident to me is that the farmers who spend as much time as they possibly can in their fields, nurturing their crops and guarding off unwanted pests and livestock are the ones that reap the rewards come harvest time. What I would like to achieve in writing this article is to see more subsistence farmers take on the role of nurturer and protector. We need to stand guard over our crops until we reap the last cob. Just as we nurture and protect our children from infant to adult, so too we need to take on a parenting role over our crops if we would like to see them yield and succeed. So, what are these challenges and what do farmers do in the field to combat them? 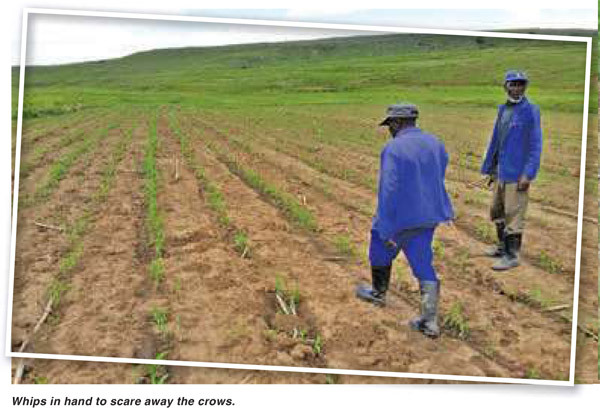 Crows are an absolute menace and can cause huge damage in maize that has just germinated. As the little seedlings pop through the soil, the crows peck them out one by one, line for line. If we leave them to feast on the seedlings, there will be nothing left. Be ever present in your maize field from dawn to dusk. Put in the hours of effort so that you can have something to harvest. I would like to use the example of two farmers in the Hlathikhulu area of KwaZulu-Natal, Mr Mzwayi Zuma and Mr Musa Khumalo. These two dedicated farmers cultivate neighbouring fields on approximately seven hectares of land. They take shifts guarding their crops by using whips and sling shots to scare the flying thieves away. It is hard work that continues until the maize pip has disintegrated underground (usually about two weeks’ post emergence), but their efforts will definitely pay off. Gerbils are small little rodents that cannot resist any grain and are becoming a big problem in South Africa. Their numbers seem to be growing every year, largely due to the lack of predators which prey on them. They usually live in colonies in the maize field which can be identified by lots of little holes close together the size of tennis balls. They can consume huge areas of planted grain in your field which reduce your yield and are also an eye sore as weeds flourish where the soil is uncovered. Many farmers battle to find solutions to control these rodents. There are chemical control measures which can be used to either treat your seed when you plant or to put down their holes. I am not going to discuss these measures in this article. For more information, you can contact your local chemical representative to assist you. But even without making use of chemicals one can still make a big difference by simply employing a few basic control strategies. Remember that nature is amazing in providing balance. Where man interferes, this ‘balance’ can be disturbed. So, take note of how things work in undisturbed environments and try to replicate this. Plant poles around your field to assist the owls to hunt the gerbils. Don’t kill snakes! Snakes are a natural predator of rodents. If we kill snakes the rodent population will explode as we are witnessing. If you see a snake while working in your field, just leave it to do its job. Lastly one should also become creative. I would like to use the example of Mrs Sindisiwe Gama in the Loskop area near Estcourt. With the assistance of her son, she made hundreds of small traps using wire and mesh and placed them all around the field near the Gerbils holes with grain inside to lure them in. They were especially successful during the winter months when food is scarce. If you are patient and dedicated to the task you will notice a marked improvement when you plant again. Cattle in the rural areas are the number one pain for any maize farmer planting on communal land. The problem especially occurs in the months leading into winter when grazing starts becoming scarce. 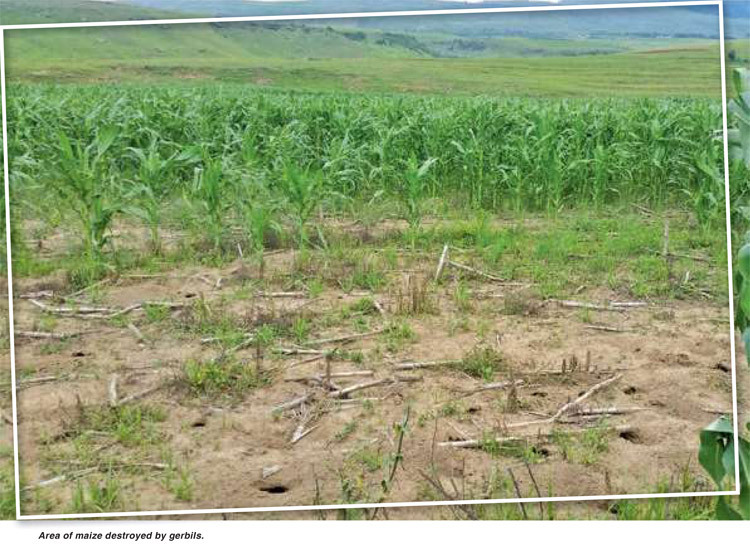 Livestock owners push them into the communal cropping land where there is still plenty of food causing big damage to the maize in the fields. Therefore, many farmers reap their cobs before it is dry and transport it to their homes for storage. This results in loss of weight on the cobs as well as rotting cobs. The obvious solution is fencing your field; however, fencing gets stolen which is why farmers are reluctant to erect them. The second option is to negotiate with the livestock owners and come to an agreement to keep the cattle out until harvest time after which they can make use of the stover left on the fields. One could even get the local counsellor or Nkosi involved in these negotiations. If all these fail, you have little other choice but to put in the hard effort once again and stand guard over your field. If you can’t then ask your brother, if your brother can’t then ask your father. Just don’t leave your valuable crop to get destroyed. Nurture and protect, stand guard! Put this into action in your farming enterprise and you will see your efforts rewarded when harvest time comes. I truly hope to see more and more subsistence farmers take this to heart. It will only lead to better household income for you and your family and contribute to food security in our country.